Category 5 hurricanes may have slammed Florida repeatedly during the chilly Younger Dryas, 12,000 years ago. The cause? Hurricane-suppressing effects of cooler sea surface were out-weighed by side effects of slowed ocean circulation. That's the finding of USGS researcher Michael Toomey and colleagues in their Geology article published online today. As the last ice age waned, undersea landslide deposits called turbidites captured the fury of Florida's stormy days. Previously, Toomey linked turbidites in the Bahamas with modern hurricanes. For this study, the group examined turbidites in cores spanning the shift from the Younger Dryas into the warmer early Holocene, collected offshore the Dry Tortugas, Florida. The turbidites, complete with smashed up shells and jumbled sediments, reveal that in Younger Dryas days Florida was surprisingly hurricane-prone, at a time when cooler sea surface temperatures may have put the brakes on such intense storms elsewhere in the Atlantic. To explore why, Toomey and colleagues analyzed computer models that simulated ocean and atmospheric conditions near Florida during that period. In modern times, the Atlantic Meridional Overturning Circulation (AMOC) brings cool water south and warm water north. But during the Younger Dryas the AMOC is thought to have weakened considerably, slowing circulation and reshaping environmental conditions across much of the Northern Hemisphere. 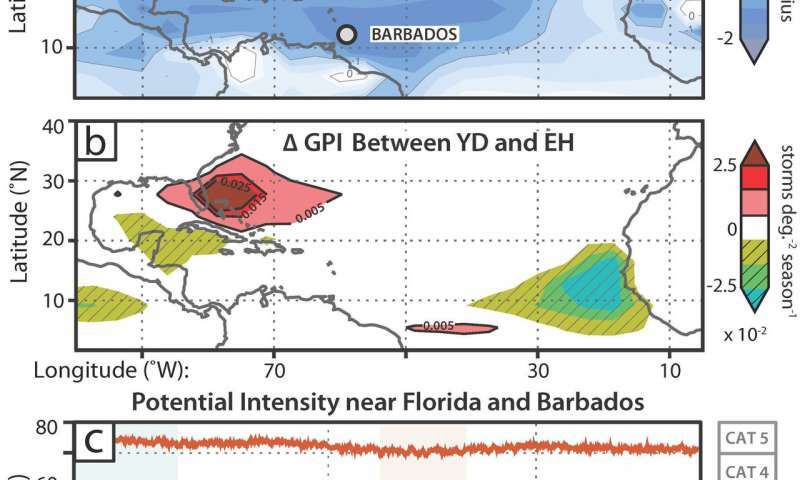 Modeling results indicated that lower sea surface temperatures in the tropical Atlantic, near Barbados, for example, corresponded with a drop in storm potential intensity. Near Florida, sea surfaces cooled as well. However, the change there was not as dramatic as further south or to the north. The relative warmth of waters offshore the southeastern U.S. compared to the regional Atlantic, explains Toomey, seems to have set the stage for intense hurricanes near Florida. "The modeling work suggests other factors, such as wind shear and humidity at mid-latitudes, outweighed changes in sea surface temperature at our core site," he says. Models and geologic records both show that by the early Holocene, as the AMOC regained strength, Florida's hurricanes subsided. The results, says Toomey, reveal that when it comes to generating hurricanes, ocean circulation plays a powerful role. What's more, he adds, the study demonstrates that on certain types of coastlines, turbidites have great potential for unraveling ancient hurricane histories. However, Toomey cautions against applying the results directly to future hurricane activity. He says for that, we need more field data and higher resolution models. "That's where I see this work headed next."